The alcoholic beverage giant has a strong track record of making the right investments to grow its business. Constellation Brands (NYSE:STZ) stock checks a lot of important boxes for investors. There's the market-thumping sales growth in its beer portfolio, for one. Add soaring profitability to the mix and it's easy to see why earnings have expanded by 20% or better in each of the last five fiscal years. CEO Rob Sands and his executive team are projecting double-digit profit growth in each of the next three fiscal years, but there's an even better reason to like this stock. Simply put: The company is good at spending money. Constellation Brands never stops hunting for products it can add to its portfolio of premium alcoholic beverages. Recent acquisitions include the Funky Buddha beer brewery in Florida and craft brewer Ballast Point. "Our eyes are always on the horizon for select, high-growth, high-margin brand acquisitions that can accelerate our growth vision," according to executives. Of course, no purchase has turned out better than its $5 billion acquisition of the U.S. rights to Mexican beers including Corona and Modelo. That buyout has helped transform Constellation Brands' business, with revenue soaring since 2013 and operating margin spiking to 30% of sales from 20%. The company aims to extend that acquisition winning streak with bold moves like its early push into the global market for edible cannabis products. It recently bought about 10% of Canopy Growth in an investment that management hopes will give the company prime market position ahead of marijuana legalization in Canada beginning in the summer of 2019. Constellation Brands doesn't shy away from aggressive capital investments, having added millions of hectoliters of production capacity to its Mexican breweries over the last two years. Sure, that spending has kept a lid on cash flow gains. But that short-term hit should be well worth the long-term payoff. Investors are already seeing evidence of that fact, as Constellation Brands expects operating cash flow to pass $2 billion this year, up from less than $500 million in 2013. STZ Cash from Operations (TTM) data by YCharts. Additional capital improvements on the way include an expanded partnership with Owens-Illinois that will give Constellation Brands the largest glass container factory in the world. Combined with its fifth massive glass furnace, this investment should lower costs while positioning the company to meet the robust demand that's expected for its imported beer portfolio over the next decade. A key benefit of its surging profits is plenty of excess cash that Constellation Brands can send back to shareholders even after spending aggressively on its growth initiatives. In fact, executives have spent over $1 billion on stock repurchases in each of the last two fiscal years. And, with shares having trounced the market over that time, the investment looks like a good bet. CFO David Klein sees a bigger role for dividends as a capital return channel in the years ahead, and so Constellation Brands just hiked the payout by 40%. The new dividend still only accounts for a projected 30% of annual earnings, and that low ratio is a positive sign for two big reasons. First, it leaves plenty of room for expansion toward the broader market average of about 50% in the coming years. Second, and more importantly, the payout reflects the surplus of investing opportunities that Constellation Brands faces today. 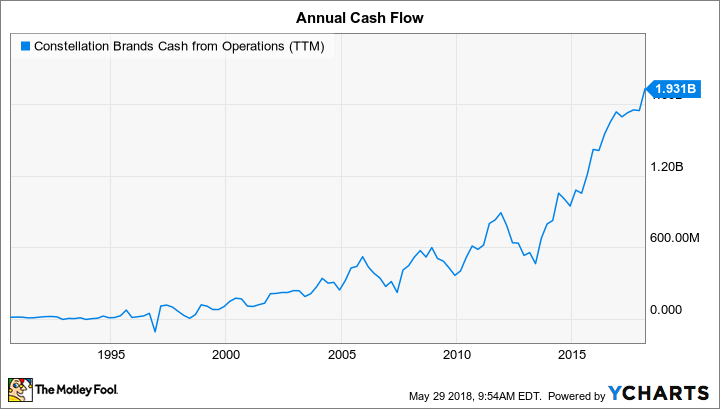 Given management's stellar track record on capital allocation and the $1.2 billion of free cash flow it should generate this year, it's likely that investors will see additional aggressive investment moves that end up boosting the company's value and expanding its long-term growth opportunities.